Specification: 75d/2, 108d/2, 120d/2, 150d/2, 150d/3, 300d/2, 300d/3, 300d/, 300d/2*3, etc. 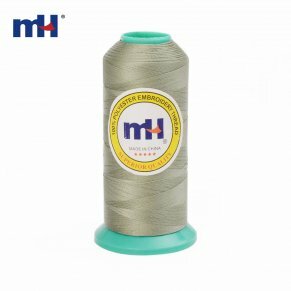 MH embroidery thread industry has a complete set of production line for spinning, dyeing, winding and shaping, working shop is around 20000 m2 with 400 skillful workers. Polyester thread offers outstanding performance for today's sophisticated computerized sewing machines, these threads on any home or Industrial machine like Brother, Janome, Singer, Bernina, Pfaff etc. Suitable for jeans, shoes and hats, lace embroidery, etc.